Some incidences leave us believing that humanity still exists and it is just our way of looking at things that force us of thinking otherwise. This incident is one such example of humanity shown by a woman and the firefighters of Indianapolis. As reported by the firefighters, the woman came at the doorstep of the Indianapolis fire station-5 around 5:15 pm. 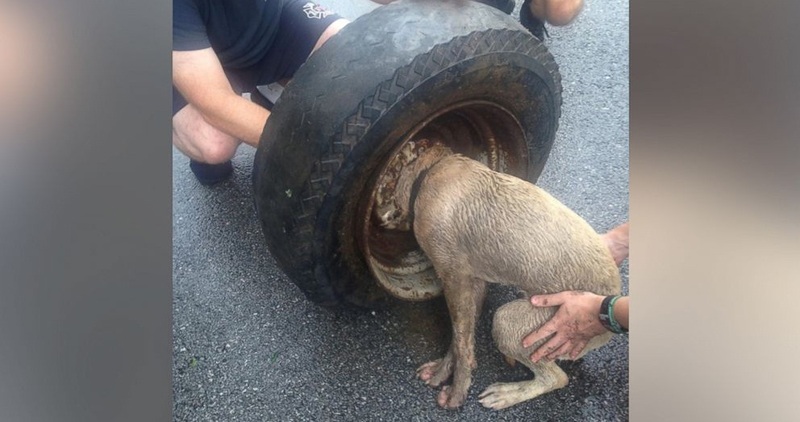 She had come with a dog stuck in the rim of a discarded tire. The dog was a stray Pit Bull mix, named Jimma. The kind woman, maybe in her twenties, further stated that she used to meet and feed Jimma twice a day. On that day when she came from work, Jimma was stuck in the tire. She loaded him in her car and drove to Indianapolis fire station where the firefighters tried the conventional ways to ease the dog’s head back out with oil and liquid soap. These ideas did not work for Jimma and the firefighters had to call an experienced crew with extrication tools. After the arrival of the crew, they planned the rescue of the stray cautiously where minimizing the possible injury was their main aim. With the loud noises of big tools scared the stray and was needed to keep her calm at the same time while working on her removal from the tire rim. They cut the tire rim with a tool used to cut brake pedals on cars. It took more than an hour for the firefighters to free the pooch. This joint venture of the woman and two teams of firefighters was a successful one. After the removal of the rim, the stray seemed to be fine and was sent with the woman. If she wouldn’t have thought of taking Jimma to the fire station, this stray would have been injured, or even killed. Let’s have a look at some of the photos clicked by the firefighters! So, as much as the firefighters are to be praised for their contribution, the woman who initiated it needs a round applause of appreciation. Such people are bliss for the society! « Why Pet Sitting agencies are becoming popular?